This journal presents detailed coverage of the complex field of corporate governance, and issues surrounding effective transparency of information for publicly listed companies. The International Journal of Disclosure and Governance balances its coverage between academic discussions of theory, and practical cases in real life. 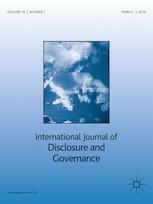 The journal offers global perspective on disclosure and governance matters, presenting articles which describe practices in the U.S., Bangladesh, Nigeria and Saudi Arabia, among other countries. Coverage ranges across the landscape of enterprise, from public corporations to closely held family businesses. Topics addressed include the impact of bad governance practices in a concentrated ownership environment; and the influence of the board of directors on performance in family and non-family firms. The Journal also covers practical topics, such as how and why an independent audit matters; the possible impacts of auditing standards on auditor behavior; insight on spotting trade-based money laundering; and many others.